A native Land Dayak chief in Sarawak, Malaysia. Bidayuh is the collective name for several indigenous groups found in southern Sarawak, Malaysia and northern West Kalimantan, Indonesia, on the island of Borneo, that are broadly similar in language and culture (see also issues below). The name Bidayuh means 'inhabitants of land'. Originally from the western part of Borneo, the collective name Land Dayak was first used during the period of Rajah James Brooke, the White Rajah of Sarawak. 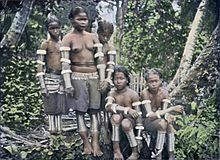 At times they were also lesser referred to as Klemantan people. They constitute one of the main indigenous groups in Sarawak and West Kalimantan and live in towns and villages around Kuching and Samarahan in the Malaysian state of Sarawak, while in the Indonesian province of West Kalimantan they are mainly concentrated in the northern Sanggau Regency. In Sarawak, most of Bidayuh population are found within 40 km of the geographical area known as Greater Kuching, within the Kuching and Samarahan division. They are the second largest Dayak ethnic group in Sarawak after the Iban and one of the major Dayak tribes in West Kalimantan. A Bidayuh man with a flute from Sarawak, Malaysia. Predominantly Bidayuh areas in Sarawak are: Lundu, Bau, Penrissen, Padawan, Siburan and Serian. Most of the Bidayuh villages can be found in the rural areas of Lundu, Bau, Padawan, Penrissen, and Serian district. The area continued to the adjecting West Kalimantan border where they resides in Kembayan, Noyan, Sekayam and Jangkang district in Sanggau Regency. The area in which they live is mainly in the basin of the Sarawak River and hilly to mountainous forest, traditionally worked by rotational agriculture and hunting based around farms populated from parent villages situated on the hills for protection. Today, almost all the traditional longhouse-villages have been replaced by individual houses, by roads and there is some plantation agriculture and a reduced emphasis on the growing of hill-padi. Fruit trees, especially Durian, remain important property markers. The distinctive architectural and cultural feature of the Bidayuh is the head-house, now adopted as a symbol. Lundu speak Jagoi, Salako and Lara. Bratak, Singai, Krokong and Jagoi speak Singai-Jagoi. Penrissen speak Bisitang also people in Kampung Bunuk speak Bunuk (Segu-Benuk). Bidayuhs who live around Serian such as Tebakang, Mongkos, Tebedu to Tanjung Amo near the border of Kalimantan Indonesia speak Sadong. Several kampongs in Serian speaks Bukar language as for an example Taee Village. Bidayuhs in Padawan speak several but related dialects like Bi-anah, Pinyawa, Braang, Bia', Bisepug and Emperoh/Bipuruh. Bidayuh Moden speak mixed languages, mixed languages between Padawan and Jagoi language (Semeba, Tematu, Bumbok and Sudad). The dialects are not mutually intelligible and English or Malay are often used as common languages. Bidyuh borich or female witch doctors, 1908. Bidayuhs are traditionally animist, and vestiges of these beliefs still remain. 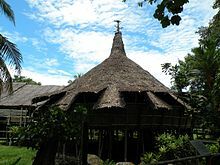 The Brooke Family era saw the arrival of Christian missionaries from 1848, bringing education and modern medicine, the similar process were also taken place in Dutch Borneo in the Dutch controlled side. The great majority of Bidayuh are now Christians, majority of them being Roman Catholic. 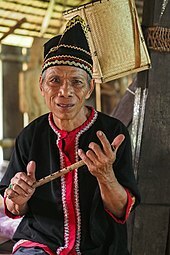 Almost 90% of the people of Bidayuh has changed their traditional name to English name since they converted to Christianity and many young indigenous Bidayuh people in Sarawak will never practice their ancestors ceremony any more and indirectly it has weaken their culture as indigenous people of Sarawak. The original Bidayuhs are mainly Pagans or animist before they convert to Christianity and they believe in ancestral worship and they also believe in the ancient spirits or nature. Due to that, they would have big celebrations like the Gawai (1 June) which is a celebration to please the padi spirit for good harvest and nowadays since 50% has converted to Christianity, the young Bidayuh generation will only celebrate Christmas as their first priority celebration. Most Bidayuh villages have either a Roman Catholic or Anglican church or a mosque but few villages are Muslims—rarely more than one or the village would tend to split. The Biatah people, who live in the Kuching area, are Anglican, while the people of the Bau area are Catholic. Now some renowned church also being establish in some villages such as SIB (Sidang Injil Borneo) also called as Borneo Evangelical Church, Baptist Church, Assemblies Of God church and other churches as SDA, Latter Rain. The Bidayuh of Bau have a unique tradition of hanging the bodies of the dead on trees and leaving them to rot away. The skeletons are left on trees as a reminder of the dead. The tradition is rarely done nowadays. Although classified as "Bidayuh" by the Malaysian government, the Salako and Lara culture have little resemblance to other Bidayuh groups and their oral tradition claim different descent and migration histories. Linguistically, the Salako belong to another language family tree which is of the Malayic Dayak family (the same family as the Iban). 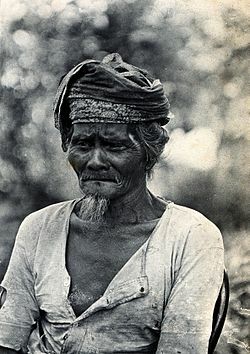 The Lara, although said to be more related to the Bidayuh (Jagoi-Singai), speak a language almost not mutually intelligible at all with the Bidayuh but belonged to the same language family tree which is the Land Dayak. Even their customary rituals and rites differ from the other Bidayuhs (all Bidayuhs share almost the same ritual and customary rites). A traditional Bidayuh baruk roundhouse in Sarawak, Malaysia. It is a place for community gatherings. 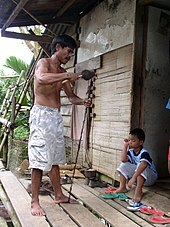 A Bidayuh man making rope in a traditional method. The Bidayuh have a musical heritage consisting of various types of agung ensembles - ensembles composed of large hanging, suspended or held, bossed/knobbed gongs which act as drone without any accompanying melodic instrument. James Dawos Mamit, Malaysian cabinet deputy minister. Pandelela Rinong, Malaysian national diving athlete. Made Katib, former Anglican bishop of the Diocese of Kuching. Richard Riot Jaem, Malaysian cabinet minister. Tony Eusoff, actor and model. ^ Saw Swee-Hock (2015). The Population of Malaysia (Second Edition). Institute of Southeast Asian Studies. ISBN 98-146-2036-X. ^ M. J. Melalatoa (1995). Ensiklopedi Suku Bangsa Di Indonesia, Volume 1. Departemen Pendidikan dan Kebudayaan RI. OCLC 37396203. ^ a b Shiv Shanker Tiwary & P.S. Choudhary (2009). 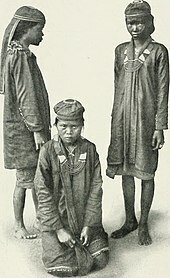 Encyclopaedia Of Southeast Asia And Its Tribes (Set Of 3 Vols.). Anmol Publications Pvt. Ltd. p. 247. ISBN 81-261-3837-8. ^ a b Lucas Chin & Valerie Mashman, ed. (1991). Sarawak cultural legacy: a living tradition. Society Atelier Sarawak. p. 21. OCLC 1027899014. ^ a b Akhmad Saufi; Imanuella R. Andilolo; Norain Othman; Alan A. Lew, eds. (2016). Balancing Development and Sustainability in Tourism Destinations: Proceedings of the Tourism Outlook Conference 2015. Springer. p. 90. ISBN 98-110-1718-2. ^ Pat Foh Chang (1995). The Land of Freedom Fighters. Ministry of Social Development. ASIN B0006FECIK. ^ Rintos Mail (1 November 2015). "Serving up unique Bidayuh cuisine". The Borneo Post. Retrieved 6 March 2018. ^ Tamara Thiessen (2008). Bradt Travel Guide - Borneo. Bradt Travel Guides. p. 247. ISBN 18-416-2252-4. ^ The Rough Guide to Malaysia, Singapore & Brunei. Rough Guides UK. 2015. ISBN 02-412-3808-0. ^ Patrick Rigep Nuek (2002). A Dayak Bidayuh community: rituals, ceremonies & festivals. Patrick Rigep Nuek. p. 12. ISBN 98-341-1500-8. ^ "Bryan impi jadi jurulatih renang" (in Malay). Sinar Harian. 15 April 2013. Retrieved 21 September 2018. ^ "Ex-Miss World contestant Dewi Liana's second single album in the works". Bernama. 17 July 2016. Retrieved 17 July 2016. ^ "Lessons from East Malaysian storytellers". The Nut Graph. Retrieved 11 July 2015. ^ Shaiful Shamsudin (27 January 2017). "Venice arkitek kejayaan ATM benam MISC-MIFA" (in Malay). Stadium Astro. Retrieved 21 September 2018. Patrick Rigep Nuek (2002). The Dayak Bidayuh Community: Rituals, Ceremonies, and Festivals. Wikimedia Commons has media related to Bidayuh people.